New York Police 1st issue Patrolman badge #28 1845 - 1857. NYPD 1st issue Captain's badge. Engraved Capt. Azel Freeman, 16th Patrol District. Circa 1849. 1st issue NYPD Reserve Corps folded point star #84, issued 1853. The Reserve Corps: Chief Matsell established the "Reserve Corps" in 1853 as an elite unit of approximately. 100 of the best and most competent patrolmen and sergeants. By 1855 it numbered approximately 150 men. They were assigned to the chief's office and other high profile assignments such as detective duty, the courts and various other details, etc. On occasion, the reserve corps would fly to various areas of the city and were used for duties similar to those performed by today's Borough Task Forces. Courtesy Michael E. J. Bosak, historian NYPD. According to Our Police Protectors, page 126, being selected to the Reserve Corps was, "A virtual promotion, and was calculated to stimulate a laudable ambition among the men, and to encourage them to a more faithful and zealous performance of their duty." New York Police 1st issue Asst. Captain badge. 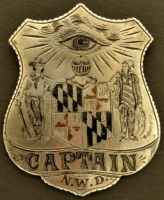 From 1845 until the charter of 1853 this style badge was worn by an Assistant Captain. Each Captain had two Assistants. The Assistant Captains each commanded a platoon in the Patrol District. Beginning in 1853 the title was changed from Asst. Captain to Lieutenant, the badge remaining unchanged. 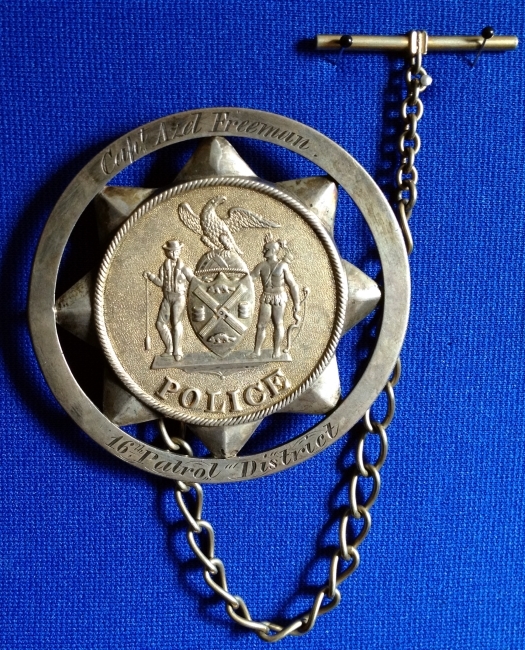 New York Police 1st issue Sergeant badge 1845 - 1857. White metal. In 1855 there were 88 Sergeants. 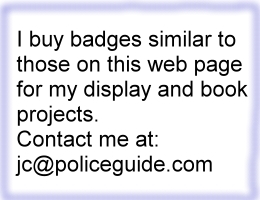 The position of Roundsman was adopted in 1862 under the Metropolitan Police Act, after they had gone to the 2nd issue badge. born Mar. 20, 1809 in New Jersey. 1837 New York City Directory shows him employed as Marshal. 1840 the New York City Directory shows him employed as Constable. May 1841, to May 1842 Documents of the Board of Alderman shows him as a Constable of the 11th Ward. 1842-3 Manual of the Corporation City of New York he is listed as a Constable of the 11th Ward. Proceeding of the Board of Supervisors May 31, 1844 to October 7, 1847 shows him as a Constable of the First Ward. 1849 Manual of Corporation for the City of New York shows him as the Constable of the 16th Ward. From the 1850 Manual of the Corporation of the City of New York we learn that on May 9th, 1849 he was appointed Captain of the 16th Patrol District of the New York Municipal Police Department. His residence was listed as 691 Hudson Street in Manhattan. Our Police Protectors Book by A. E. Costello published in 1885 on page 114 reads: The term for Captains was two years. On page 115 we read that on April 11th,1849 the term for Captains, Asst. Captains and Policemen was increased to four years from date of appointment. The Sixteenth Patrol Division station house was located on Twentieth Street, between Seventh and Eighth Avenues. 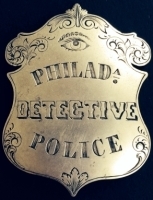 The district had a force of 43 officers in May of 1848. The Captain of each Patrol District divided the Policemen of his district into two equal parts, to be known as the first and second platoon, which were commanded respectively by the first and second Assistant Captains.